The British gentlemen who “discovered” the stunning scenery of Tyssedal and Odda in the 1820s were the first of a large number of tourists to visit this beautiful area. The main attractions for the tourists were the waterfalls and the glacier. Foreigners were more than willing to take on a demanding all-day-journey just to be able to admire the impressive Tyssestrengene and Ringedal falls. Tyssestrengene falls has a sheer drop of more than 300 metres, the highest in Norway. Ringedal falls is actually higher and larger, but has a sheer drop of “only” 160 metres. The Norwegian Mountain Touring Association (DNT) made an early effort to preserve these waterfalls, and they obtained an easement on the nearby farms for this purpose. In 1920, under intense pressure from industrial developers, the organization abandoned its principles and sold the rights to Tyssefaldene falls for 250 000 crowns. DNT did, however, take the initiative to preserve Vettisfossen, a magnificent waterfall in Sogn og Fjordane county. Today, the waters of Tyssestrengene and Ringedal falls are diverted for power production, but the waterfalls flow once again whenever there is an overabundance of water in the water basins in the mountains above. Property speculators and engineers also discovered these waterfalls. In the course of a few years, starting in 1906, Tyssedal developed from a valley with just a few farms to an industrial community. It lies 460 metres above the pioneer hydropower station Tysso I, which is majestically situated on the shore of the fjord. It was here that the industrial adventure really began. The farmstead here is ancient and dates back to at least the Middle Ages. Like many other farms, it was vacated after the Plague. The owners died or moved to more fertile land elsewhere. Documents from 1616 describe the farm as “abandoned”. Later in the 17th century, however, people resettled the farmstead. Bears were once a major nuisance for the farmers in the valley, killing many sheep. The farmers used spring-guns to try to rid themselves of the bears; the last one was killed in 1876. There is a place by the lake still called Sjølskott – “Spring-gun”. Even pack horses couldn’t traverse the first trail to Skjeggedal, so until 1898, the farmers who lived there had to carry everything on their own backs. Their loads were rarely lighter than 50 kilos. After 1850 there was a growing stream of tourists to Skjeggedal. In 1898 the Norwegian Mountain Touring Association, DNT, began to build a new trail, in order to make the valley more accessible, for pack animals as well as people travelling on foot. By the time the Old Tourist Trail was completed in 1904, total costs had reached 12 000 crowns – an astronomical figure at that time. According to an old legend, Skjeggedal valley is named after an outlaw from the Telemark tracts that lie to the southeast. Skjegge (meaning beard), settled here, in the most remote area he could find, while he let his hair and beard grow, making him unrecognisable. If so, it must have been long ago; in Hardanger, the name Skjegge can be traced back to 1293. There is also another possible explanation. On Iceland, Skjeggjadal, means a valley where a bearded troll lives behind the waterfalls. At the dawn of the industrial development, 21 people lived in Skjeggedal. Today parts of the valley are under water. An average annual precipitation rate of 1178 mm certainly contributes to the local hydropower production. Lake Ringedal is 8 kilometres long. It is used a s forebay by the power company. The first Ringedal dam, started in 1909, was 280 metres long and 16 metres high. After an additional stage was completed in 1918, the dam was 529 metres long and 33 metres high. The thickness of the dam varies from 4 metres at the top to 21.5 metres at its foot. Migrant workers, or rallar, came from all over Norway, and even Sweden, to work on the many projects in Tyssedal. Old railroad workers, who had built the Bergen line across the mountains, met the sons of farmers and youngsters who had never before been away from their village. A lot of work had to be done quickly and many strong hands were needed. During construction, 300 migrant workers were active in Skjeggedal and another 200 in Tyssedal. As a result, change came rapidly to the narrow and once sleepy valley. Experienced Swedes became the very symbol of the rallar and had the highest status. In everyone’s imagination he wore a felt hat, white shirt and vest, and had a pinch of snuff under his lip. Many Norwegians, too, imitated this image. One boy from Hardanger even earned the nickname “The Little Swede”, while other youngsters happily paid the real rallar good money for lessons on how to curse in Swedish! The migrant workers worked hard and long days for little money, and they had few days off. The work in the steep terrain of Tyssedal and Skjeggedal was very risky as well. Some of the work had to be done while they hung suspended from ropes. Yet in a year and a half, 500 rallar built a 3 kilometre long tunnel from Skjeggedal to Lilletopp lake, they erected a power station and pipestock, built a wharf and constructed a cable car, raised an office building, homes for the engineers, barracks for the workers, and hung a power line all the way from Tyssedal to Odda. Impressive by any standard! Hardangervidda plateau is known to have unusually many and rich occurrences of quartz. 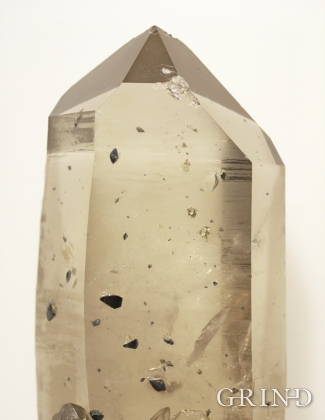 Another metal-coloured mineral has grown on some of these quartz crystals, known as anatas (titanium dioxide). This rare combination is sought after by mineral collectors from around the world. The biggest occurrences are found at Matskorhæ. This locality has long been protected. Fine specimens are exhibited both at the Norwegian Hydro-power and Industrial Town Museum In Tyssedal, the Natural History Collections in Bergen (photo) and the Geological Museum in Oslo. The route on our Wilderness Experience goes right through this rare location. How do I get to Trolltunga? Odda is the main town and point of reference you want to reach. It is located at the southern tip of the fjord named Sørfjorden, and you can get there from Bergen or Oslo by bus boat and train. If taking public transport, it can be a tricky place to get to so be aware that you may be taking several modes of transportation. From Odda to the starting point of Trolltunga, you need to take a bus towards Tyssedal and up to the trailhead called Skjeggedal. Use this convenient travel planner to figure out bus times and routes for the local buses, boats and trams. Also feel free to contact the Odda Tourist Office for more detailed information about the hike, accommodation and maps. Bergens Airport (Flesland), is 3 hours drive from Odda. You can either travel by bus, og by boat to Rosendal, where there is corresponding bus to Odda. Stavanger Airport (Sola), is 4 hours drive from Odda. This is the closest airport to Preikestolen (Pulpit Rock), if you’re also planning to hike this. Drive to Odda and follow the road marked RV 13 to Tyssedal and then follow the signs towards Skjeggedal. The parking lot is approximately 7 km from there. A new road has just opened that continues 4 km further above Skjeggedal, however the capacity is limited so get there early! Click here to see a YouTube video of the new road. From Stavanger: The Trolltunga - Preikestolen express and Nor-Way bussekspress will take you to Odda bus station. From Bergen: Bus route 930 will take you from the stop Bergen bus station to Odda bus station. From Oslo: Bus route Haukeliekspressen will take you to Odda. To travel from the bus station in Odda to Skjeggedal, transportation is either by bus (July - August) or maxi-taxi. The Trolltunga - Preikestolen express bus ensures you arrive at Preikestolen and further on to Trolltunga – or the other way round. If you want an unforgettable life time experience in the Norwegian mountains with a final destination of Trolltunga, you are going to want to book Trolltunga Adventures! My husband and I can’t stop talking about the incredible service, care, and the personal attention to detail Stian & Thomas gave each one of us hikers. A lot of hikers start pretty unprepared for to Trolltunga, so we thought we’d try to help out future hikers with this guide to conquering Trolltunga. Even people who have been enjoying Norway’s many mountains their entire lives have a healthy respect for them, and take care to be well prepared for every eventuality.